It’s a marriage that (almost) tore apart because of a government law. Y’know, two people love each other but can’t be together because of politics — like gay marriage only everything is different and not at all related to gay marriage. 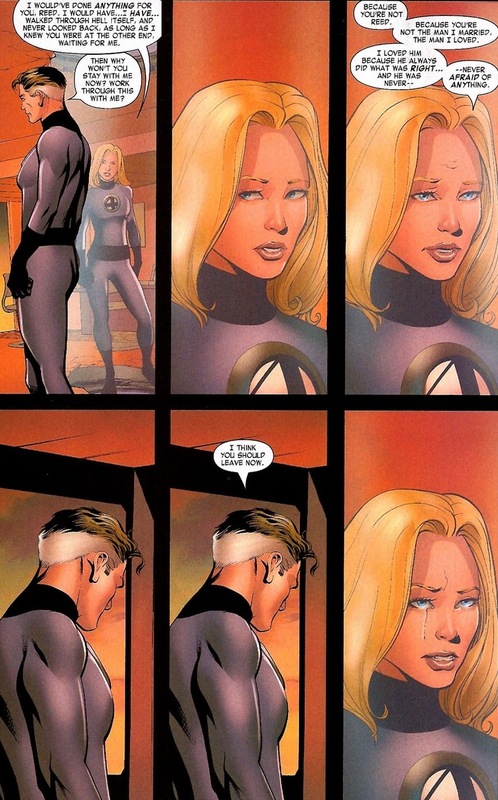 Unfortunately, Marvel’s number one couple hits a rough patch every other year or so. Mr. Fantastic tends to have trouble treating his two soul mates equally (Susan Richards and science), and Mrs. 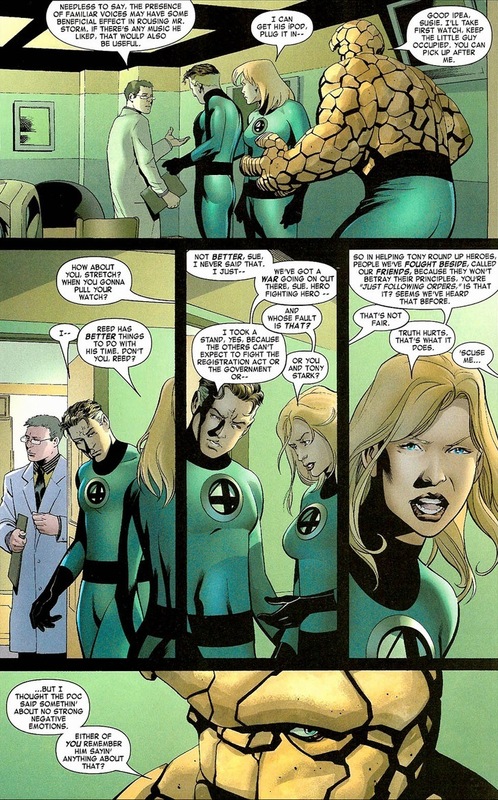 Fantastic spends most of her day switching between forcefield-ing catastrophes and taking care of her four kids (Franklin, Valeria, the Human Torch, and the Thing). So all the camel’s back of their relationship needs is a single piece of straw to pierce the camel’s soul and destroy decades of built up happiness and trust (not a great analogy) — until the status quo returns, of course. And thank god, because I don’t think I could ever be emotionally ready for that marriage to end. 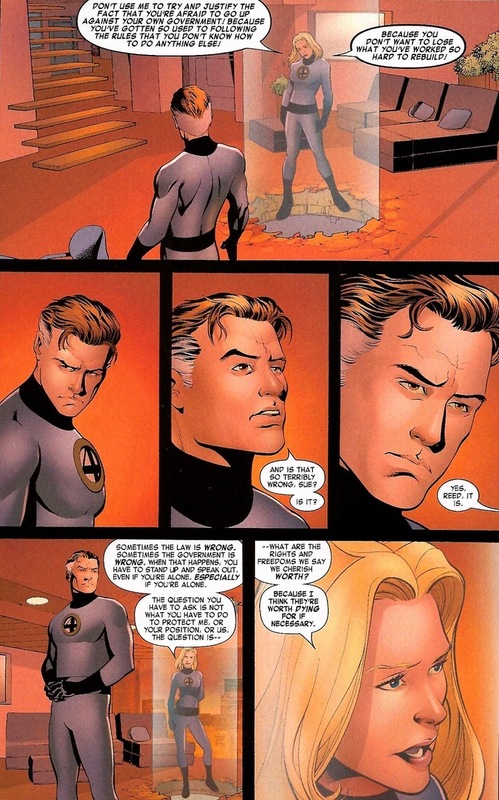 As one of the architects of the Superhuman Registration Act enact-ers, Reed Richards spends even more time in a lab coat with goggles. He gets busy imprisoning all his former friends, especially after his brother-in-law ends up in the hospital after a mob attack. C’mon, all married couples have fights. A lovers’ spat won’t hold them down as their wedding vows and devotion towards each other’ll propel them to once again unite for the sake of their loved ones. Until the moment when one of the Negative Zone tubes burst. Remember a few pages up when Mr. Fantastic told his wife that they’ll talk about this later in that same tone I use before I send kids to the principal’s office? It’s time. 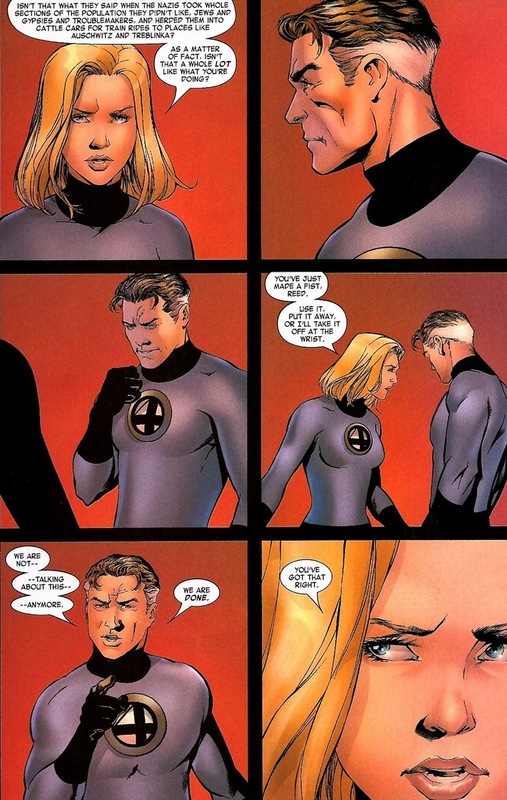 I absolutely adore both of them, but my goodness, the Invisible Woman’s phenomenal. I completely understand Namor’s infatuation and I can’t see why she doesn’t get more credit for being a positive female role model in comics today. Male writers only gave her an outfit that exemplified her cleavage once briefly back in the ’90s. That’s all. 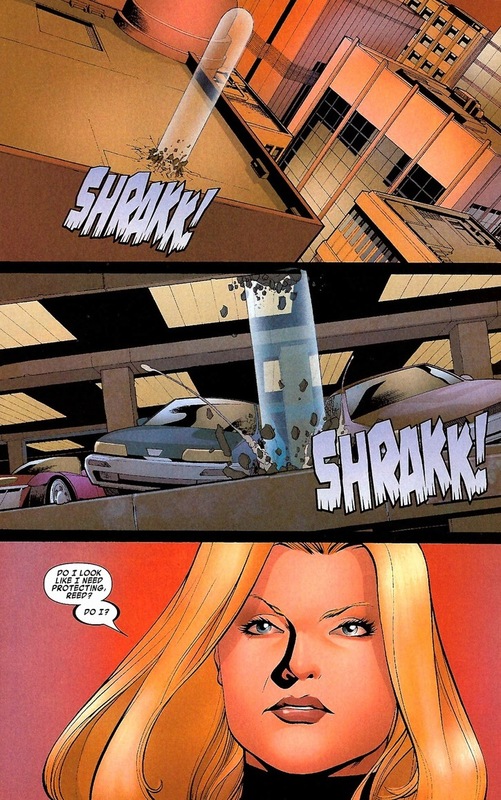 But most importantly, both her kids are well-adjusted, she doesn’t take crap from her husband (or bad guys), and remains the pillar holding together Marvel’s very first super-team. Plus, she’s not afraid of wrecking her home to prove a point. Let’s talk about Sue’s argument. The Holocaust point doesn’t really hold up, because once superheroes register with the government then they have free rein to go about their happy, law-abiding business. Also, very few Jews can bench press trucks or spout adamantium claws from their hands. 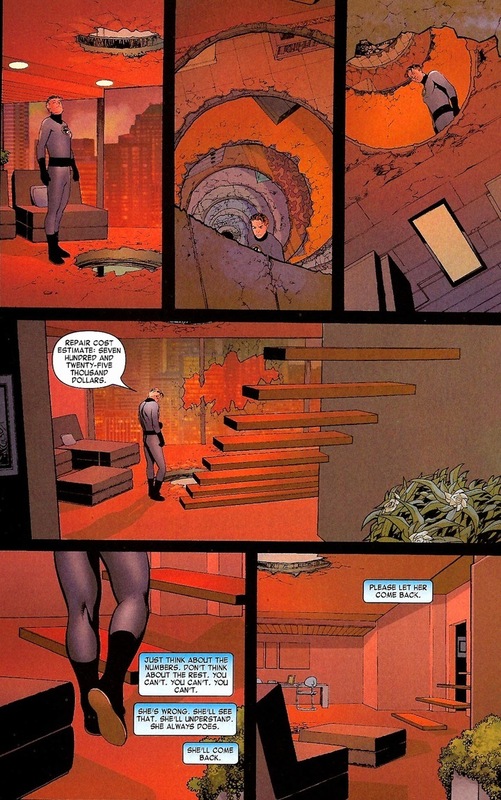 But Reed’s “I’m protecting you!” argument also comes out as a pathetic lie the moment the words leave his mouth. 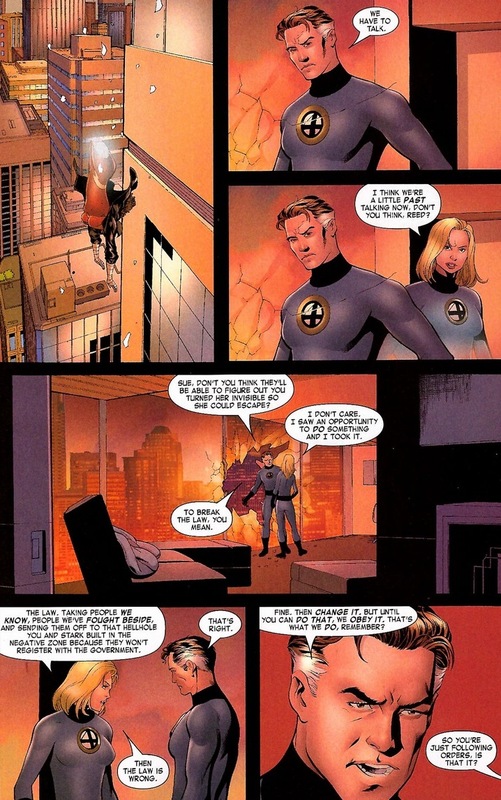 Both are wrong mainly because the Civil War sits caked in heavy coating of gray area, but Sue did touch upon something that holds absolute truth: no supervillain in the world can break up their marriage, but that doesn’t mean it can’t be bent from within. The Thing had the right idea fleeing to France for a while. Look, everything in comics always comes down to Spider-Man’s mantra: with great power comes great responsibility. The responsibility to hold the family together. The responsibility to serve one’s country. The responsibility to stay on the moral path. So how can either Mr. Fantastic and the Invisible Woman possibly win an argument when they’re both right and wrong? But have no fear — on Friday we’ll have a happy ending. Those are the best kinds. And this is why I utterly loathed Civil War. Because I loved these characters – Reed and Sue, Tony and Cap, and so many others, and because setting half of these up against the others requires that at least half of them stop acting like heroes and start acting like scumbags, and that hurts. In fact, I gave up on Marvel after this arc. 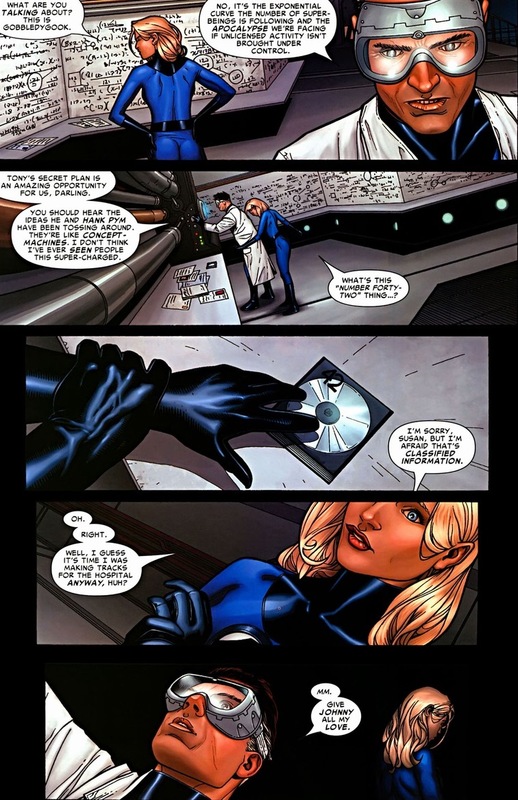 As I mentioned before, the writers of Civil came down with laser-guided amnesia and conveniently forgot that Reed denounced the Mutant Registration Act on several occasions (especially since his son Franklin is a mutant), and yet now he’s supporting the SHRA which was basically a more extensive version of the MRA. Also, I totally agree with Jason on Sue’s stripperiffic outfit from the 90’s – that was a low point for Sue, the FF comic, and women in general. It made her Malice costume look modest. That’s why Civil War fails, because the government agency is reacting to fear and restricting freedom. And given the Red Skull infiltrated the White House before, and Norman Osborne seized control after, would you really want the names and identities of MCU superheroes in the governments hands? You’re right – I hadn’t thought about that. Plus if you saw the new Cap movie (SPOILER ALERT!!!! ), the government and SHIELD were both infiltrated by HYDRA for YEARS. And in the 70s, the Secret Empire had sleeper agents inside the government, all the way up to President Nixon himself. Looks like the US Government in the MU needs to clean it’s own dirty laundry first before expecting everyone else to fork over their dry cleaning. People keep saying that during the Civil War arc, characters kept acting OUT of character… TO some extent, I say that may be the case, but that behaviour is part of the story. 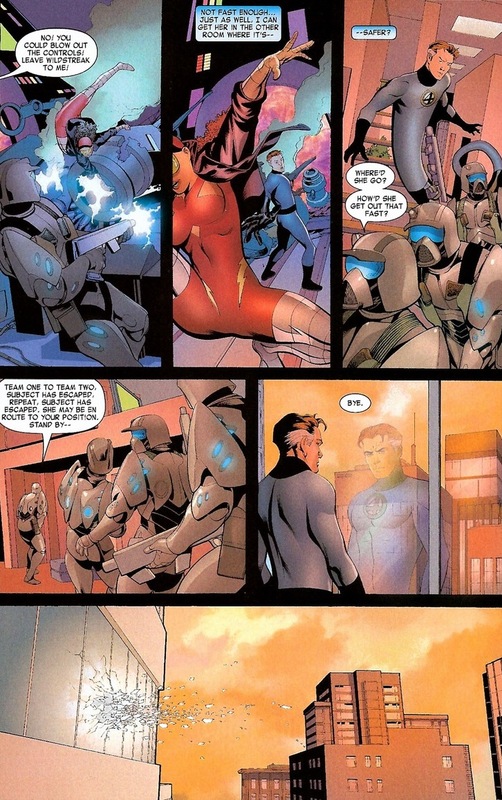 Tony was himself, but more so, pushed to do extreme things in an effort to protect the people, to protect other super humans who had a good relationship with the law, and to protect himself. He, and Reed, and countless other Avengers and allies were not publicly outed (some were), but the government had files on them all, or access to the Avengers information. If the Government wanted to round up heroes, who do you think they would start with? So the big brains played hardball for the registration side. They went waaay too far with 42, and some of the other aspects of the plan, but we are calling this “out of character”? The same guys responsible for shooting the Hulk into space “just in case” shocked us with an attempt to lock up super humans off world? The super militant registration side was portrayed as villains in this story because they turned on their friends and neighbors… Sounds kind of like how back in WWII friends turned on each other because of how they had a German sounding last name. Or how Americans were turning each other in to the House Un-American Activities Commity between 45 and 75. Or How in the last decade or so the color of your skin or how vaguely middle-eastern your name sounds could get you detained under the Patriot Act. Hell, I’m Canadian, and know people who were detained at American borders for undefined reasons for going on shopping day-trips into the States. The country reacted to a threat, but the reaction was poorly executed. Now put it in context. There are laws to control deadly weapons, laws to control the use of hazardous machinery. Why shouldn’t there be laws or at least a system to control the actions of dangerous individuals? Deep down, we know that a teenager who can melt cities with their hands is a dangerous thing. Be it due to mutation or cosmic rays or a boon from gods, a person that can wipe out large chunks of the population because they didn’t like that their fav band only made it to #3 on the local radio top ten list needs to be addressed. The Mutant Registration Act tried to do this, but rather than train, understand, and help the individuals, it became a nightmare for them. The Super Human Registration Act was the same, only now people who were off the MRA hook were now at risk. The 50 States Initiative was, and is a good idea. Avengers Academy is a good idea. Bringing in people who are well outside the average, training them to control and better use those abilities, and helping them become a contributing part of society helps them and us move into a better future. But this is comics, and if something doesn’t go wrong and needs punching, it’s gonna get boring. The SHRA put the fear of God into a lot of super humans. They always thought they were safe, that issues like this only happen to mutants, or other people, but now they saw it at their own doorstep. 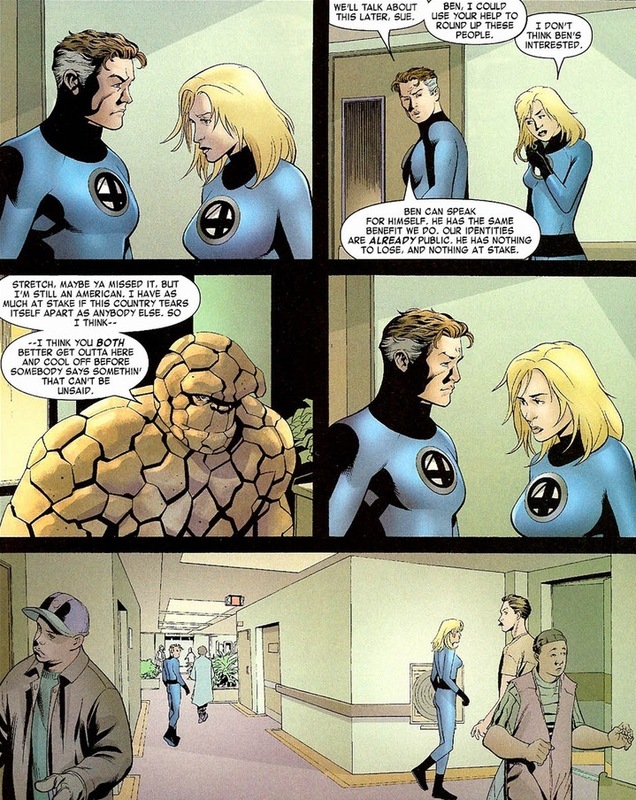 And because they had failed to act when they saw it happen to others it twisted the knife that much further in their own hearts.A lot of people saw Reed saying “I’m protecting you” as if he was protecting her from physical threats. 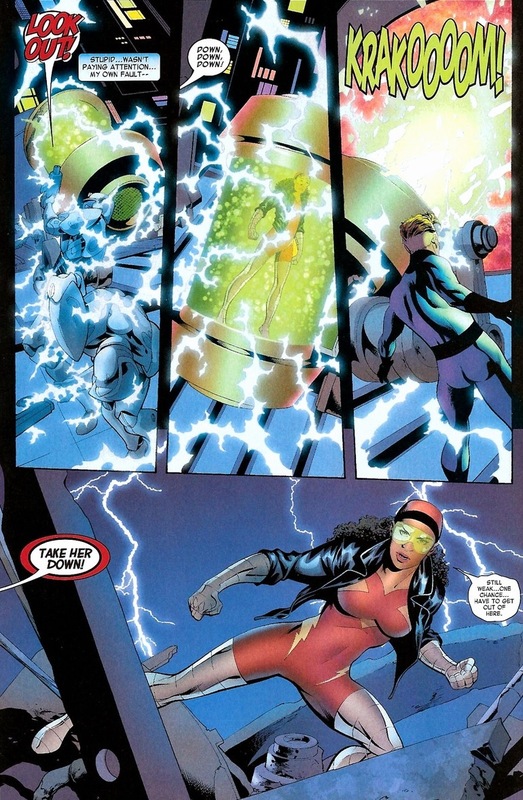 In his mind he was probably trying to protect her from the actions of her own government, the shock troops, and SHIELD agents with “cape killer” rounds in their guns (funny, not a lot of capes in Marvel’s stable), and being considered a threat and public menace by every American citizen on the street. The same people they had saved over and over. The same people who mount flags on their SUVs. The same ones who turned on their friends and neighbors for something as harmless as the color of their skin and the sound of their name. But in typical Reed fashion ( he IS the biggest d-bag in all of comics ) his idea of protecting his loved ones from that threat was to make that threat even deadlier. I fail to see how this is out of character for him. He never tried to help the mutants until his own kids became known mutants themselves. He never tried to help Spider-Man deal with the daily persecution he deals with. He goes about his days in that lab doing whatever the hell he wants to the detriment on his family or friends until something drags him out and he as to come help the tiny brains. This time it was his own inaction that was the wolf at the door. Things he never helped his friends and loved ones with in the past were now coming for him. So he went about dealing with it in the worst possible way. Sounds like Reed to me.